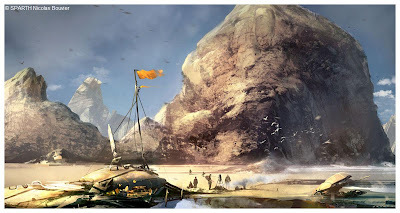 Nicolas “Sparth” Bouvier was born in France, but in 2003 he left Paris for Montreal joining the team of Ubisoft and working on their projects, “Prince of Persia Warrior Within” and “Assassin’s Creed”. In 2005 he moved to Dallas, Texas spending there three years working for IDSoftware and from January 2009 he lives in Seattle, Washington and joined the team of Microsoft for the project HALO. 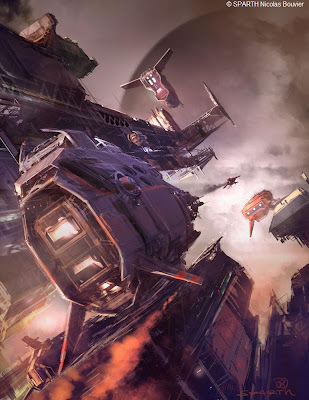 Sparth’s works were published in many art books and catalogues and also were gathered in a personal art book, “Structura – The Art of Sparth”, which was published in 2008. 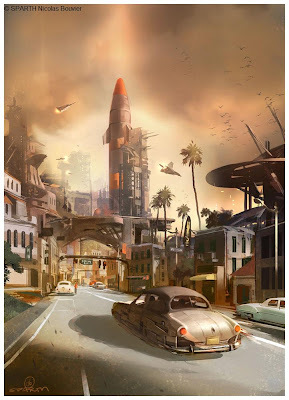 Sparth also illustrated many book covers published in USA, France, Germany and Romania, especially Science Fiction novels. Dark Wolf: Nicolas, thank you very much for the opportunity of this interview. Can you trace your love for art? What is your first recollection about art? Sparth: I guess there’s something within myself that has always been there. Even though I’m not really liking the idea of having empirical talent or being predestined. When I was about six, I was often putting small texts with images, drawing animal stories about birds and little pigs. I suppose that I already needed to convey things in a graphic way. I can clearly remember I was creative during my youth. And you know how it goes at this age. The more you’re encouraged by adults who think you’re doing a great job, the more you’re pushing your own boundaries, conscious, in a way or another, that you’re doing a much better job in that field, than your little comrades.When I was living in Singapore around 82, I also remember how I had spent days trying to create a large battlestar galactica spaceship with cardboard and glue. Not to forget I really was a Star Wars addict. Singapore was a very safe city to the point where I could hail a taxi to go in downtown with my brother who was eleven at the time, to go see Return of the Jedi at the theater. The cinema was always having these huge painted giant poster scenes from the movie on the façade, instead of the conventional known posters like in the US. It was having a big impact on the people I believe. It was so big, all hand painted. I went back three others times to the same cinema to see it again and again. Of course, I can also remember all these times where I went to art museums with my parents. It also played a big role but in a different way. Dark Wolf: Why do you call yourself Sparth and where did this nickname come from? 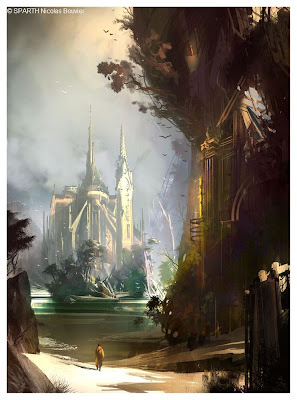 Sparth: Sparth was a name that I thought described me well, as during years, I’ve been pretty much a workaholic, pushing my own limits to the point where I needed to slow down to avoid health issues. When I was young I had that book about ancient Greece, and about these Spartan kids who were forced to rub snow on their body to clean themselves during winter time. It struck me as a kid. It was so extreme. I guess it described me well even though there’s no way I’d go naked in the snow to clean myself! Dark Wolf: How did your travels influence your works? 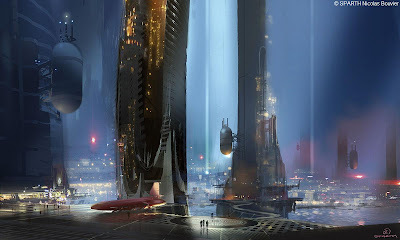 Sparth: I think that any times you give your brain new horizons to discover and visit, you’ll do him a big favor and he’ll grow bigger, storing all these details that you will be able to retranslate in your art years later. It is even more important at an early age. I can see my kids being fluent in English and French. They’ll keep this within themselves, and it will be useful one day in a way or another. Seeing the world expands our minds. It’s a fact. Let me give you an example. At the beginning of the eighties I remember having participated to an art contest organized by the French school of Singapore. A famous French military boat called “Jeanne d’Arc” was going to come during several days to the island, and the students had to paint it the best way they could. I won the contest and as a result, met with several people in uniforms, without knowing at all how important they were. I won several books and objects. Today, whenever I think of a military boat, I have the “Jeanne d’Arc” in mind. Its shape and colors are clearly engraved in my mind. It’s following me through the years. Life is about this succession of events that are memorable only to you. And it’s even more the case when you travel a lot. That’s when things happen. DW: From all the places visited and the cultures met which one had a more impact on your art? Has one in particular influenced your works more? S: As a Sci-Fi fan, I’d say the biggest impact for me still comes from the US. There are so many people here that know and “breath” science fiction and fantasy, as something totally natural and logical. It’s here that you get things done. When it comes to the wonders of the world I’ve seen, there would be too many things to mention… walls of giant butterflies in the Malaysian jungle, black volcanic sand on a Bali beach, giant stingrays in the Everglades. It’s all stored in my mind, and I suppose all these details are shaping my own art. DW: One of your greatest passions is clearly seen on your works and I refer here to architecture. What attracted you in the first place toward architecture? What possibilities are offering the architectural forms to work with and how are they different than a character creation for example? S: My dad was actually taking care of that big French construction company, the same one that had built the Eiffel tower in 1889. He was himself in contact with many renowned architects. As a result, architecture related books and materials where sometimes around the house. It must have been having an influence on me for sure. Architecture is all about the interaction between man and a created environment. It is very connected to concept design as both try to improve, extrapolate and amplify the world we live in. DW: How did you become involved in the game industry? Was working in this domain a personal goal or it was just a work offer at first? S: It started in Paris around 96 or 97. At that time I was a freelance artist, graduating from the ENSAD in Paris. I was mainly doing works for the book industry, as well as doing images for scientific institutes. My friend Mathieu Lauffray told me one day that I should meet some friends of his who had created a design company, which I did. That company, called LCD Multimedia at that time, changed its name to Verity Inc for about a year. And then switched its name again, for good this time: Darkworks Studio. It became one of the biggest French video game studios. I stayed there about 6 years. Left in 2003 to go back abroad. It was not a personal goal at first. I was convinced I was going to end up in the comic industry, or doing children’s book. But the video game industry was growing bigger and bigger every year. Seeing all these art positions popping up one after the other was pretty logical when you retrospectively look back. We all took the train as it rushed forward into the unknown. That’s the way I see it. DW: What brought new in your art the experience from the gaming industry? Did your art or the style of work changed after this experience? S: Well, it became more professional in many ways. At that time, freelancing was all about meeting clients around Paris, and work for them from your apartment, then go back to their company or publisher in order to give them your images, from your hands to theirs. Working for a studio was so different. Even though we were inventing all these jobs and positions, I could respond to a specific task, and do my best for it. Even more important, I could also work with a team. You work and learn faster when outsides eyes can help you grow. 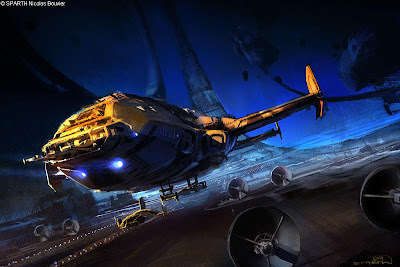 DW: Many of your artworks are focused on Sci-Fi genre. Is this genre your main source of inspiration and what attracted you toward it? S: Well once again I really do think I belong to the Star Wars generation. There’s nothing more exciting than doing your own visual projection into the future. Not to forget about something I find extremely important. When you do your best to imagine the future, it’s a way to conjure or transcend death. Several months ago, my 5 year old kid told me something I’ll never forget. He explained to me with his own words that there were two ways to think about a specific situation, 1) being into that situation and living it for real 2) dreaming it. I’m condensing his own explanation, but as simple as it seems, I was struck at how deep that thought was, especially at his age. Science fiction is all about dreaming what could become the future, and if there hadn’t been a Jules Verne for example, maybe submarines or even planes, would not have seen the day before several centuries. Who knows? DW: Speaking of Sci-Fi I’ve seen a number of book covers illustrated by you. How was the work in this field? Would you like to illustrate a particular novel or the works of a particular author? S: I’ve illustrated more than 50 book covers since 2004, and I am honored having done so. It’s a real pleasure doing book covers, as that type of work differs a lot from the long gaming projects I’ve done, and that sometimes last several years. On the contrary, doing a book cover is a “one shot” event, very challenging on a short term. No matter the author, I’ve always considered an honor having my images on specific novels that I love. DW: Remaining in the book covers field, your work, like yourself, travels around the world through the novels illustrations. And with the access to Internet now your work travels worldwide. How do you feel knowing that every day your work is admired in a different corner of the world? S: I feel extremely honored, that is a sure fact. I don’t think I really grasp how great it is though. I mean by this that after all these years, I still spend a lot of time trying to outpass myself and finding new ways of expression via my art. And I often forget about the final published products and where they go to. It’s all about achieving a mission, and switching to the next one. I tend to forget looking back, and quantify all these productions I’ve been doing over the years. This is why I decided to publish my artbook STRUCTURA. It’s a way of putting a personal milestone on paper. DW: In the future would you like to work with someone in particular? Would you like to work in a new domain? S: If it’s art related, and if it allows me to be as creative as in the gaming industry for example, then yes. I’d be ready, one day, to try working in new domains. But to be honest, after nearly four years in Texas, I needed a big change. And Microsoft, as well as Seattle, where I live now, is clearly representing that change. It’s very exciting to work for the Halo franchise, and I plan to keep doing so for quite some time. DW: What projects do you have in the near future? S: Apart from doing my everyday concept job, I’d be interested to maybe work on a second artbook. I have plans for it, even though there’s no rush. “Create less, but better” would probably describe me best and could be my actual motto. For an extended biography and for a massive gallery of Nicolas "Sparth" Bouvier's works please visit the artist website, Sparth.com. Wonderful interview and I am really impressed with the portfolio. I just love the feel of the work. What a portfolio! Every picture has its own atmosphere. Impressive, as edFanoB stated, the sense of atmosphere is very well done. I love this guys work! Really very impressive works, I must say. Once you’ve discovered these kind of fantasy arts you won’t be returning to earth anytime soon.